Hanzi Smatter - this is an amusing blog about misuse of eastern characters in western culture. It’s mostly about hilarious (or just plain wrong) translations for tattoos (especially Chinese), but I consider it a “beware!” sign of how difficult it may be to get an accurate translation. Japanese Text Initiative (University of Virginia) a nicely organized and laid out collection of Haiku, available in English, Kanji and phonetic version. JapanKalligraphia.hu is the website of Gáncs Nikolasz - who teaches ShoDo in Budapest. Joy o’Kanji Eve Kushner has decided to write one essay about each of the 2,136 Joyo kanji, the written characters used in daily life in Japan. The essays, which feature wonderful kanji photos, are downloadable in PDF format for a very reasonable price. The site has lots of enjoyable trivia about various kanji even if you don’t buy the essays. Scans of the ancient 裴休 (Pei Xiu’s) Chinese calligraphy book, in Kai Shu - i.e. Standard Style, or Kaisho. The rest of the site is well worth a look, too. Denshi Jisho - an easy-to-use and powerful online Japanese dictionary. 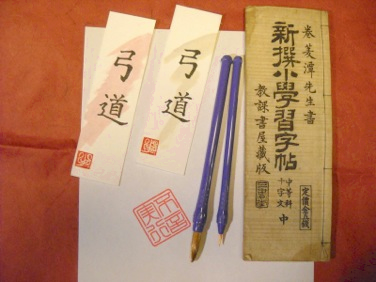 Oriental Outpost produces beautiful Oriental scrolls, and they have recently created an online dictionary where you can look at tens of different styles searching either by English word or by ideogram(s). Sho Do: The Art of Coordinating Mind, Body and Brush by William Reed. This is a great book for beginners and intermediate Sho Do students alike. Please understand that this is not a manual, but a deep and lucid book on why ShoDo matters, and how to get better at it in terms of understanding and deepening your ability to appreciate (and sooner or later produce) beautiful calligraphy. Calligraphy grid - at the Incompetech site you can find, among other things, a PDF generator allowing you to create different types of grids. You fiddle the various parameters and download a PDF that you can print on your own printer. The first link takes you directly to the Japanese Calligraphy grid generator.